Colorful, Healthful Salad – My Favorite! I am obsessed with all the fresh kale and greens this spring, so every day for the past two weeks I’ve been playing around with different salad dressings and ingredients. My favorite so far? A hearty green salad filled with nutritious nuts, seeds, avocado, mango, etc., etc. — the ingredients and combinations are endless! One day I used previously served, shredded halibut and blood oranges instead of chicken and mango. 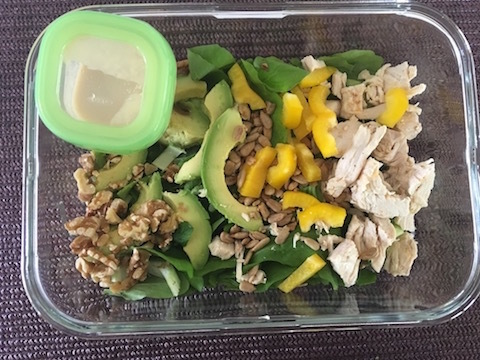 A few days ago, my daughter stopped by on her way home from work so I made her this salad for lunch, sans the mango since she does not care for chicken and fruit in a salad together. The citrus dressing was OK for her too. Incidentally, this combination is now one of my favorites. I hope you try this soon — particularly while the little Manila mangos are still available. They are so yummy we have been eating two mangos per day (for two adults, not bad). And remember that this is a perfect salad to pack for work or on the go. Approximately 2 cups of fresh arugula or romaine or napa cabbage a combination of these greens. I usually do a combo. Layer all of the ingredients above in any way you wish: I always put the lettuce on the bottom of a jar or glass pyrex dish then add groupings of the ingredients. Pour about 3 Tbsp of dressing into a small container alongside the salad. When ready to eat, coat the salad with the dressing and mix well. Note: If I plan to add chicken to salads or pasta during the week, I take chicken breast halves on the bone with their skin Blot off any moisture with paper towels, then place the chicken on a square of foil, season the skin liberally with salt, pepper and smoked paprika and seal the foil tightly. Bake on a tray in the toaster oven (preheated to 425) for 40 minutes. Cool, remove skin and bones and shred or cube. I keep the bones in the freezer for chicken stock. This entry was posted in Salads & Dressings, uncategorized and tagged Kale, Miso Dressing, Nutty Citrus Miso Dressing, Salad. Bookmark the permalink.